There is no question that Amazon is one of the biggest and most important names in e-commerce today. Allowing customers to choose and purchase products from different companies before delivering to their homes, the company has created a great reputation for itself. Not content with this, the company has decided to expand its business model to include grocery delivery services. This article will go over the most important aspects of Amazon Grocery Delivery. In August of 2017, Amazon took over Whole Foods Market. Since then, there has been great expectation regarding the company’s plans to get into the grocery delivery business. Without a doubt, many people will be happy to find out that the expectation is now over as Amazon has officially instated its grocery delivery service. Through an official statement, the company has announced that it now delivers groceries from Whole Foods locations for orders of 35 dollars or more. Started by Jeff Bezos in 1994, Amazon has been making waves in the electronic commerce world for some time now. Almost a decade ago, the company decided to expand its business model by breaking into the grocery delivery market. As a result, Amazon Fresh was created. However, it wasn’t until very recently that Amazon made the definitive move into direct, express grocery delivery through the creation of the Whole Foods Prime Now program. This expansion was made possible by Whole Foods being bought by Amazon in June of 2017 for a whopping $13.7 billion. The acquisition turned Amazon into the fifth-largest grocery retailer in the United States. The creation of this new service, however, will consolidate the company’s takeover of the grocery delivery market. How Does Their Delivery System Work? Without requiring a monthly subscription fee, the service allows customers to order a variety of fresh and packeted products to be delivered to their home within two hours, including fresh produce, meat, seafood and some alcoholic drinks. It’s important to note, however, that not all items will be immediately available for delivery. The service itself has been streamlined and designed to be as efficient and straightforward as possible. Customers may place an order through the company’s website or its Prime Now smartphone app. Without a doubt, this process will make the selection and purchasing of grocery items much easier and convenient. The signup and authentication processes are simple, straightforward and quick, only requiring an Amazon ID and a ZIP code number. Once you place an order, a trained picker will collect the items directly from the nearest Whole Foods location. Immediately after, they will deliver the items directly to your doorstep. As of today, the service is available only in some specific neighborhoods in a few cities of the United States. However, Amazon’s plan is to gradually roll out this service to reach the rest of the country before the end of the year 2018. 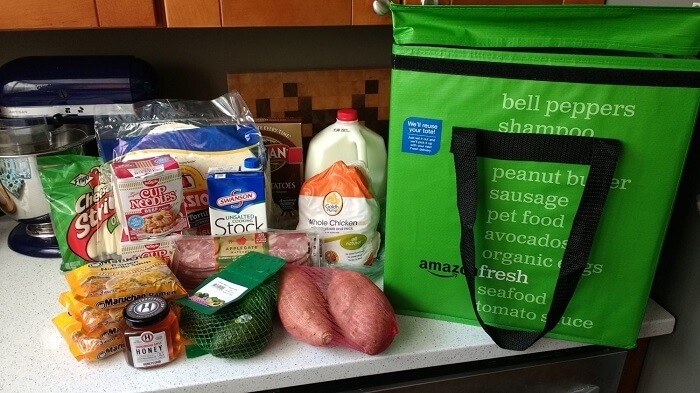 Amazingly, Amazon’s Grocery Delivery is completely free. Additionally, customers who want their groceries delivered in less than an hour can pay a fixed fee of $7.99. Currently, this delivery service is in its test phase. As of today, this promising service is only available in a few select neighborhoods in Austin, Cincinnati, Dallas and Virginia Beach. However, during the better part of 2018, Amazon will be expanding its grocery delivery service to reach the rest of the United States of America. Before the year ends, most Whole Foods stores will be using the Amazon’s Grocery Delivery service. In most locations, Amazon’s grocery delivery service will be available whenever its affiliated Whole Foods store is open. In most areas, this is from 8 AM to 10 PM. For specific cases, you can obtain the information regarding Amazon’s Grocery Delivery time by consulting the service’s dedicated website. In terms of wait time, Amazon guarantees that they will deliver each grocery order within two hours after you place it. In addition, Amazon offers its Prime customers the opportunity of getting their orders in less than an hour for a small and reasonable fee. As previously mentioned, Amazon’s Grocery Delivery service is completely free or all orders of $35 or more. However, Prime customers who want their groceries delivered faster than that may choose to pay a small fee of $7.99, which enables them to receive their provisions within one hour of placing the order. • Lowered grocery prices: Apart from making way for the delivery service featured in this article, Amazon’s buying of Whole Foods has allowed the company to lower the prices in a multitude of grocery items such as produce and meats. Without a doubt, this makes Amazon’s Grocery Delivery a lot more convenient and overall valuable. • Benefits for Amazon Prime members: The incorporation of Whole Foods by Amazon will also bring a series of benefits for Prime members. So far, these benefits constitute mostly of discounts and promotional packages that may result in important savings for customers. However, Amazon has made clear that it has plans to roll out various additional rewards in the near future. There are many good reasons why Amazon is one of the most important names in e-commerce today. One of these reasons is its capacity for innovation. Without a doubt, the company’s recent foray into grocery delivery confirms this fact. Are you excited about this service? Tell us what you think in the comments! Hey Buddy!, I found this information for you: "Amazon Grocery Delivery 101: Areas, Hours, Fees". Here is the website link: https://all2door.com/amazon-grocery-delivery/. Thank you.